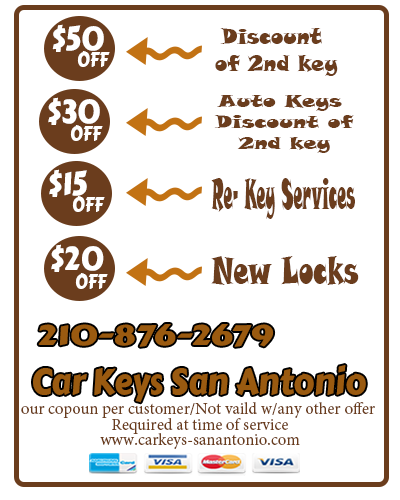 Do you need new car keys made for your vehicle right at your location in San Antonio Texas? Do you need any transponder, chip, smart, or remotes programmed for your auto keys? Did you get locked out of your car near the Alamo? 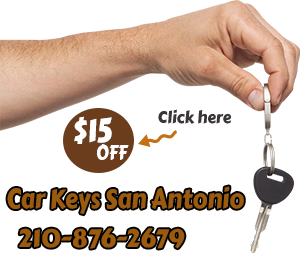 Well, if so Car Keys San Antonio, is the best locksmith company choice for you. Our mobile locksmith company is open 24-Hours every single day helping you serve any of your lock or key needs and concerns in only minutes right at your exact location anywhere in the city, using the most professional and up to date methods and techniques to provide you with quick and affordable auto mobile locksmith service all the time. When you give us a call, we will send out a trained and learned car lock expert to you, whom will assist you with any emergencies you may be faced with. These issues happen at any unexpected time and are bound to happen to any one of us at least once in our driving lives, so always keep in mind to contact a professional only without trying to break inside your car during a car lockout or try anything on your own without proper knowledge. We can assure you we have the best solutions and will deal with anything from the biggest to smallest lock or key troubles you are experiencing. When you have lost your only and main pair of vehicle keys, it can be stressful, especially when you are stranded at work and have somewhere to be. We will rapidly come right to you and make you a new car key even if you do not have the first pair of keys on spot, as we can use the vin number method. With all the stress and responsibilities, we deal with on a daily basis, we can sometimes forget many things like leaving our car keys inside our vehicles and locking ourselves out. Thankfully, living in our generation now, we can take care of pretty much anything we need using just a phone and dialing a number. 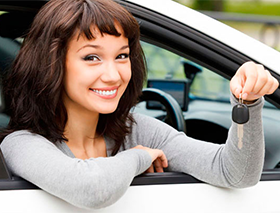 All you have to do when this happens to you, is give our mobile car locksmith companyin San Antonio Texas a call to send a professional expert right out and unlock your car door the right way in only minutes time, so you may be relived of your stressful situation and get right back on the road. We can program any of your transponder keys, chip keys, smart keys or remotes for your car right at your spot as well, for any vehicle make or year, no matter how old or new in the best fitting manner. When you have any ignition issues or troubles, we will be right with you prepared with all the tools and techniques to evaluate your problem and provide you with either an ignition change or repair depending on what your car is in need of in the fastest and most affordable way there can be. Vehicle lockouts + unlocking car door + unlocking trunk + new car key replacements + new car key made + car key replacements + transponder key programing + chip, smart, remote key programming + key removal/extraction + ignition repair/changes + more. You can count on us to do it all. You do not have to stress about our pricings as we offer you some of the cheapest mobile locksmith rates in San Antonio TX. You will always be provided with a free quote on any one of the services we provide you with before we send an expert out. Call us for any last-minute emergencies or questions you may have at our 24-Hour mobile locksmith company today or any day you may have a concern and we will be ready to help save your day.